NEXT MEETING: January 18th, 2003 6:00 at Diamond River Steakhouse, Findlay. Please call Jack (419) 358-6313 or Bob (419) 227-3305 to confirm that you'll be there. 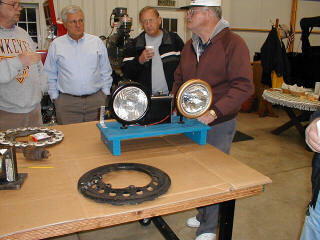 The December meeting was held at Jack Putnam's garage near Bluffton. Bob Torbet led the meeting with 8 members and 1 guest in attendance. Jack Putnam reported that the Club Incorporation has been finalized. The official name is now, "Model T Ford Club Northwest Ohio, Inc", 1215 Hancock Rd. 28, Bluffton, Ohio 45817. Our status allows us to be treated as a non-taxed entity; but, it does not allow us to buy stuff without paying sales tax. 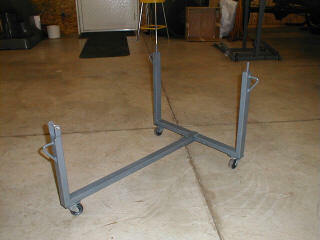 It is more of a liability safety net for the members. 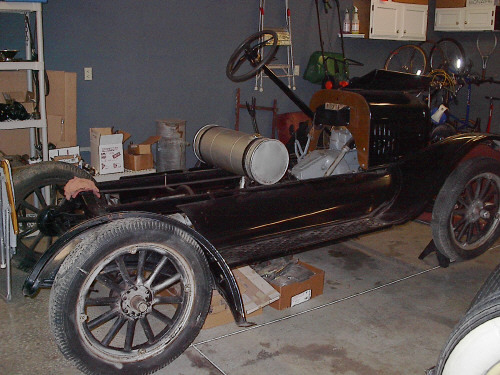 There was some discussion about becoming a chapter of the Model T Ford Club International (MTFCI). Bob Torbet has a packet that he will review. Pros and cons were discussed with some of the members not interested in personal membership in a similar club. It was mentioned that the MTFCA has not been open with their financial status. It turns out that the MTFCA had sent out proxy cards for the membership to vote on a change from a social club to an educational club. Many corporations do the same thing when they want to do something, but want to appear to be diplomatic and ask the shareholders. They word the proposition so that the leaders get their own way every time a proxy card is not returned. All unreturned proxy cards were treated as "yes" votes and therefore the powers that be got their own way. (sorry for the editorial comment) A museum had been in the makings; but, that idea has been scrapped. The Ford Motor Company has sent us a full set of news releases for the 100th anniversary of the company. The celebration coined: "The Road is Ours 100th Anniversary Celebration" is scheduled for June 12 - 16, 2003 on the grounds of the Henry Ford II World Headquarters in Dearborn, Michigan. Tickets for the 6 day event are $24.95, which includes admission and shuttle service to all of the variouis functions: Greenfield Village, Henry Ford Museum, and much more. There has been some discussion about purchasing the newest release of tapes from the MTFCA. Dave Benny will proceed with the order. These tapes are very informative and would be a welcome addition to our library. If you haven't seen the tapes in our library, you should. 2003 dues will again be $20/family this year. Once again, call either Bob Torbet of Jack Putnam to confirm that you will be at the Diamond River Steakhouse on January 18th. They need to know by the 15th. 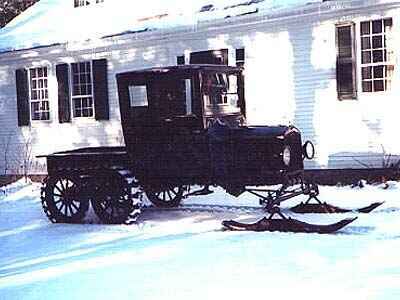 and milkmen used Model T's rigged up like this to continue with their routes year round. There were kits available during the period that made the transition fairly painless. 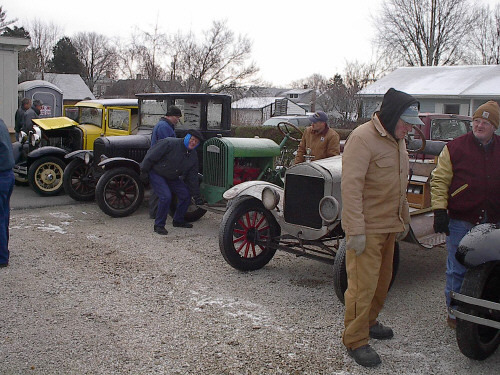 There is still a group of Model T'ers in the United States that take their T's to New England every year for a yearly romp in the snow. Most years the weather cooperates. This year will be no exception. I've been following the snowfall in Vermont, and they is somewhere near two feet in most of the state. paint shop. We can discuss the merrits of having an outdoor sale in the winter some time. It looks like fun! 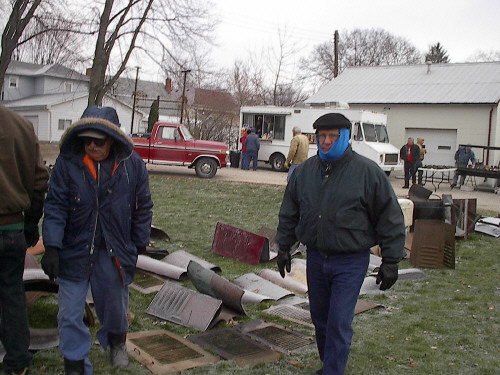 The guys in the blue bandannna and the hooded parka are Bob Torbet and Bill Sieberg. Jack Putnam took the pictueres. I haven't heard from Dave Nolting; but, I'm sure that he was there also. it was very cold that day, 30 degrees with 20 mph wind. There were bargins by the box!! This editor will assure everyone, that I would have been there if at all humanly possible. This is the best of conditions. 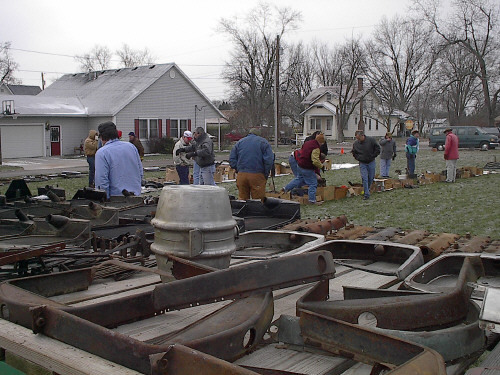 Lots of rust, cold weatherr, low turnout, and plenty of experts to help me decide what is junk and what is salvageable all add up to ideal buying opportunity. I'm really sorry that I missed this one. Bob Torbet's Newest Pride and Joy! 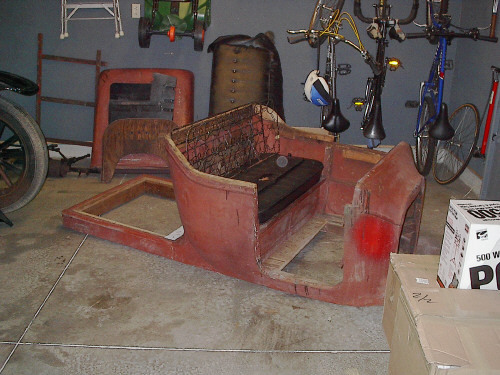 This is another case of a rescued Model T. This car has been in storage for some time. As usual, the owner had every intention of restoring it someday, but there is only so much time in a lifetime. If it had been left sitting stashed away in its former location, this car would have rusted into the stone on the floor eventually. resurrected. 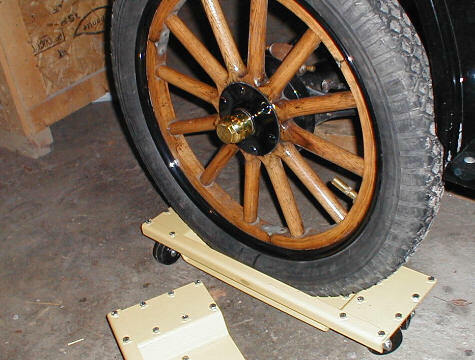 It just takes a little bit of effort and some financial input to get one of these simple old pieces of history back in shape and rolling down the back roads of America the way it was meant to by the Ford workers of almost a century ago. Bob's got the bug and this beauty will be up and running in no time. I believe that he just picked it up in the end of October or the beginning of November.